Plantar fasciitis is a painful condition that affects the bottom of the foot, more precisely in the heel (which is often call heel spur syndrome). 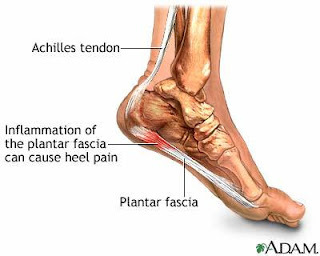 In the plantar fasciitis, there is an active inflammation of the origin of the plantar fascia and its structures, which causes pain and tenderness beneath the heel. The plantar fascia is a thick layer of tissue that goes from the heel to the front of the foot and it is this layer of tissue that supports the arch of our foot. In about 30%, both feet are affected, but non-surgical treatment of plantar fasciitis, like physical therapy, is successful in 90% of the cases. Nevertheless, physical therapy after surgery should be considered to gain mobility of the plantar fascia and reduce the pain or to restore normal sensibility, if it exists. When the foot is on the ground, it sustains a tremendous amount of force (our body weight), which causes some stress to the plantar fascia where it attaches to the heel. Some small ruptures of the fascia can occur, which are normally repaired by our body. But, in this constant and repetitive process of injury and repair, a bone spur (an outgrowth of the bone) can be formed, in a response of the body to try to firmly attach the fascia to the heel, preventing the total rupture of the fascia. The formation of the bone spur will create an inflammation, which will lead to degeneration of the fat pads. Physical Therapy in Onley and Cape Charles Virginia for foot. Plantar Fasciitis (Heel Pain). 1-7. Carr, T. A guide to heel pain (heel spur syndrome). Podiatry-At-A-Glance – Chicago podiatric surgeons. Brown, C., Nichols, D., Kalmar, H., Andreas, J. Heel Pain. DuPage Medical Group Podiatry. Tennis Injury Free. Heel Pain: Plantar Fasciitis and Heel Spur.